How do Affirmations Support Soul Healing? dedicated to supporting the new You. Affirmations shift personal energy in a new direction to release old habits and negative beliefs. Affirmations also connect soul learning with the heart’s truth and the body’s wisdom to find the restorative balance of Soul Healing. 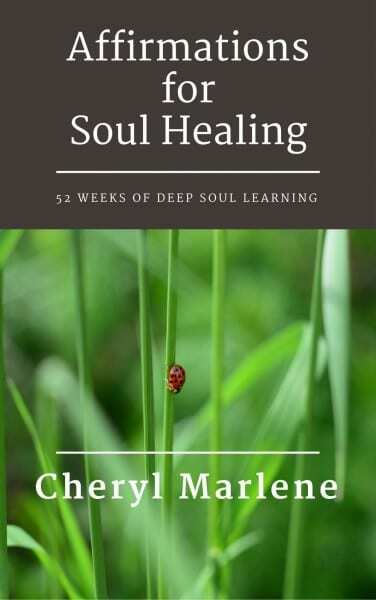 This easily-readable book is not only a how-to for beginning an affirmation practice, there are also 52 weeks of affirmations for deep soul learning. The information and suggestions in this book and these articles don’t come from theory, they come from years of my own experience. Twenty-five years ago, when I first began learning about myself at deeper, more conscious levels, I found affirmations to be incredibly helpful — and I still use them today. Through study with my Akashic Records and through my own awareness, I find suggestions for new affirmations based on whatever I am currently trying to shift and understand about myself. I almost always have several Affirmation cards hanging above my desk as reminders. Through this book and these articles, my desire is that Affirmations become a positive support for deep growth and powerful shift for you — just as they have been for me. Fear has no place in my life! Plus for each of the 52 Weekly Affirmations, Cheryl has created beautiful Affirmation Wallpapers for your Smartphone. Subscribe to receive the Affirmation and its wallpaper each week! Weekly Affirmation: My Mind Finds Peace in the Truth of My Heart.